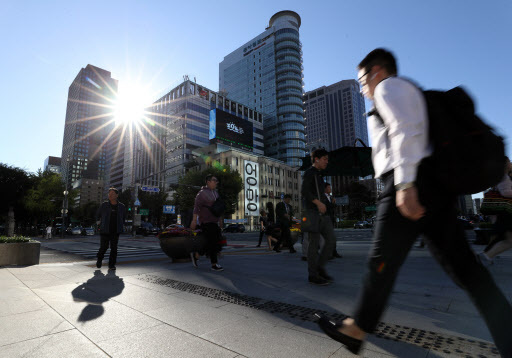 Residents in most parts of Korea woke up to a sunny albeit chilly morning Thursday, except along the east coast, where light rain fell sporadically. Temperatures in the morning plunged to 8 to 17 degrees Celsius nationwide, slightly cooler than average for the day. The daytime high in Seoul will rebound to 24 C, Suwon 24 C, Gangneung 20 C, Daejeon 24 C, Gwangju 25 C, Daegu 23 C and Busan 24 C.
As big daily temperature ranges are expected to persist for a while, the Korea Meteorological Administration advised extra attention and care be paid to one’s health. Super Typhoon Trami, which is making its way to Japan, is not expected to affect the Korean Peninsula directly. The clear fall weather is to continue throughout the weekend.